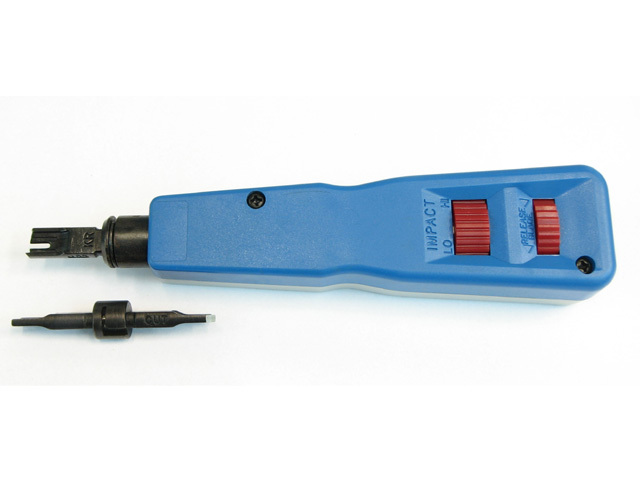 A punch down tool, also called a krone tool, is a hand tool used to connect telecommunications and network wires to a patch panel, punch down block, keystone module, or surface mount box. The "punch down" part of the name comes from punching a wire into place using an impact action. It consists of a handle, a spring mechanism, and a removable slotted blade. When the punch down tool connects a wire, the blade cuts off the excess wire.